On Oct. 28, YouTube co-founder Chad Hurley said he was stepping down, leaving Salar Kamangar to oversee the Website's day-to-day operations. 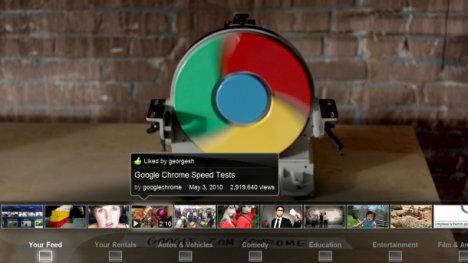 Google has been haunting Madison Avenue ad agencies to demonstrate Google TV, with YouTube Leanback as the main draw, according to the New York Post. EWEEK tested Google TV extensively and concluded YouTube Leanback is the defining application for a service that aims to serve Web content on the big screen. When you watch it, you get the sense that you are watching a B-roll of music and comedy shorts not unlike the way MTV and VH1 aired videos before they became bogged down in feckless reality TV. Except that it is fed by the Internet, not broadcast feeds, and is powered by a fast Web browser and the world's fastest search engine. Type anywhere on the screen and you can search YouTube, or hit the pause, play, rewind or fast forward buttons to maneuver around the application. This is a strength of Google TV, not a hindrance, no matter what sort of spin talking head TV types serve. Now, about the negative reviews. Google has released so many beta products over the years that it has blurred the line of what is beta and what is finished. Gold code Google TV isn't, making it a reviewer's dream for criticism. It's actually quite good for switching between TV and Web apps; going from ABC to Facebook or from Fox to Twitter, or from DVR on AT&T U-Verse to Wikipedia is a breeze. Yes, ABC, CBS and NBC all appeared at different times to be blocking their Website content from the service. And you can't access Netflix.com or other Websites from Google TV (you can access your Netflix instant queue from the Netflix app on Google TV. The service will improve over time. Android 2.1 will give wave to Android 2.2 and 2.3. Chrome 5.0 will yield to Chrome 7. Hulu ABC, CBS and NBC will broker deals with Google to get their content on Google TV. Given the steep competition from Apple TV, Roku, Boxee and other services, Google TV isn't a lock for success in the entertainment. But proclaiming the service as troubled or dying under YouTube is premature. who says you can't access netflix.com? I am able to access it on my Revue, just tried Can navigate it with no trouble at all.